The traditional bathtub is a household fixture that thankfully requires very little maintenance aside from regular cleaning. In a traditional bathtub, maintenance may involve replacing washers or valves in the faucet controllers. Because these fixtures are often partially hidden behind tile and walls they can be difficult to work on. When in doubt, contact a licensed plumber for assistance. Newer jetted tubs are likely to require more maintenance, but they are beyond the scope of this web site. Click here to view information on installation and maintenance of jetted bathtubs. 1) full shutoff valve; and 2) pull knob on the bath spout. The full shut off valve system (also called a three valve system) employs a third knob, as shown in the photo, to divert water from the tub spout to the shower. This is considered the best type of tub diverter because it completely eliminates leaks and water losses. The pull knob (also known as a “foot valve” or two valve system) is the most common tub diverter system. In these systems, when a small knob on the tub spout is engaged water is routed to the showerhead. 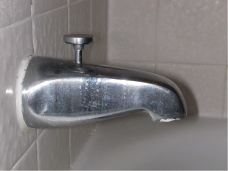 While water is running through the showerhead it is quite common for water to drip or flow from the tub spout. This is considered inefficient since the water coming from the tub spout is not put to any useful purpose and simply flows down the drain. The plumbing standard for tub diverter leaks used to be 0.1 gpm. This would result in water losses of approximately 1 gallon over a 10 minute shower. The current standard for tub diverter leaks is now 0.05 gpm – a substantial improvement.